A long time ago, in a city far far away called Olympia, WA, I used to make a dish I called Tofu Tagine about once a month. I had taken the Moroccan Tagine sauce in that long-lost copy of Joy of Cooking and veganized it with the help of the Westside Co-op's epic organic spice section and this dutch oven I found on a free table. It was my favorite dinner and made great leftovers. I used to look forward to making this dinner again the day after I ran out of leftovers. You can never have enough Tagine. 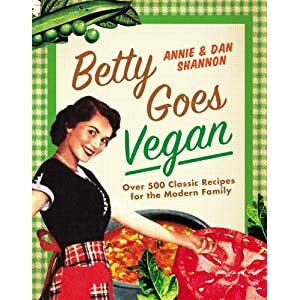 I've been looking forward to making Betty's Tagine since we started this project. Dan has never had Moroccan food before, because let's be honest here, it can be hard to find vegan options at Moroccan restaurants. I find this to be one of the most unfortunate and disappointing practices in international restaurants located in the US. There are so many shockingly great and vegan (intentional or not) dishes out there in the big world, but often times those dishes never really make it to American menus*. But that aside, I knew he would love it, since he really loves Middle Eastern food. This dish was super easy to veganize, has the most remarkable warm spicy flavor, with just the right amount of citrus, and I have to admit that it's better than the Joy of Cooking version I have been using for years. Although I might just think that because this version has olives. Whatever the reason... let's make some food! Make your Rice or CousCous. In your Dutch oven, heat Olive Oil over a medium heat. Place your Vegan Chicken in there, and with a spoon, mix the hot Olive Oil so it coats the Vegan Chicken. If you're using The Baked Tofu or Match Vegan Meats Chicken, do the same thing. Cover and cook for around 3 minutes. During that time, toss the Vegan Chicken or Tofu occasionally so that they cook evenly and the hot Oil continues to evenly coat the Vegan Chicken. Add Onions and Garlic during this time. Once the Vegan Chicken or Tofu has a nice golden brown crispy skin, reduce heat to a simmer. Sprinkle Cilantro, Cumin, Turmeric, Ginger, Cinnamon, Lemon Juice and Braggs over the Vegan Chicken. Stir until the Vegan Chicken has a nice coating. Be very gentle if you using Tofu, you don't want it to crumble. Then with your spoon remove the Vegan Chicken or Tofu from the pot and set aside. Add White Wine and Tomatoes to the pot and blend with a whisk. Then add Plums, Olives and Lemon Wedges. Simmer to a boil. Then remove from heat and mix in Vegan Chicken. Serve over Rice or CousCous with some Fresh Cilantro sprinkled over the top. ** Just to name a few (often) vegan Moroccan dishes you should check out some time: Harira (a tomato based lentil and potato stew that has lemon juice), Zaalouk (grilled spiced eggplant) and Sfaa (a couscous dish mixed with dried fruit). That looks so good! Hope to try it soon. This looks divine. I wish I could run home right now and make it! Oh, look, you've got me drooling again. I adore Middle Eastern food so I can't wait to try this! 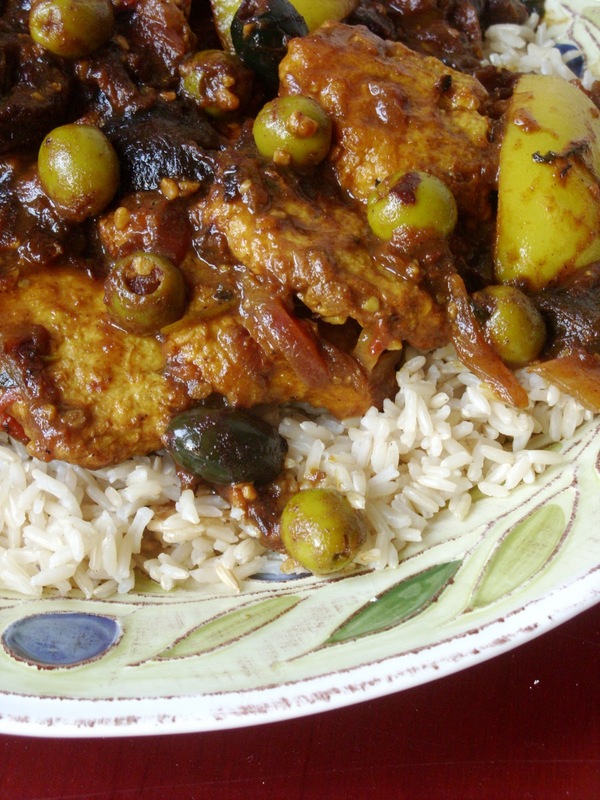 I LOVE tagine and I have been sorely disappointed by Moosewood's version. Moroccan food IS delicious, especially mint tea! Great work, Shannons! This looks so yummy I want some now!! LOL I love olives! !